You can sync your recurring one-on-one calendar event to SoapBox either in Slack or on the web and/or you can sync your recurring team meeting event to SoapBox on the web. Set your schedule clicking "Schedule this meeting" under the meeting name, or by clicking into the "Info" tab and then toggling the "Calendar Sync" Integration to "On". You can decide if you'd like to set your schedule manually or connect to your Google or Outlook Calendar. 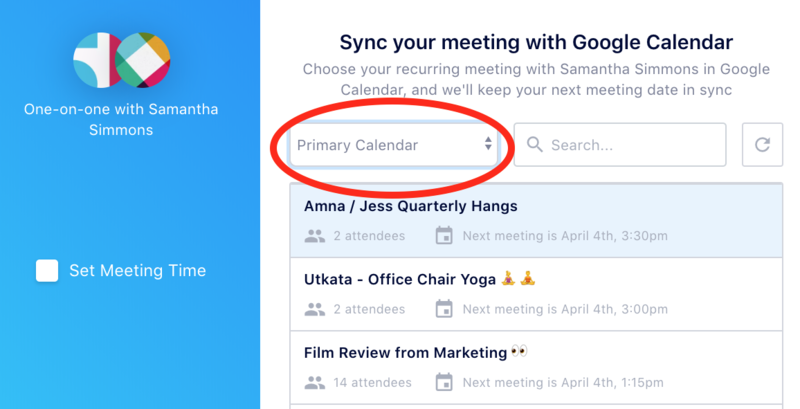 If you'd like to connect your meeting to your calendar, you will be shown all your recurring calendar events that exist in your calendar, and then you must select which event you'd like to connect your meeting to. Note: When syncing to your Google Calendar, make sure you have your "Primary Calendar" selected. What happens if I move or delete one of my recurring events in my calendar? No worries, your recurring event will still show up! Note: Once a meeting has been synced to your calendar, currently, you cannot change the type of calendar that it is synced to. Eg. if you have a meeting synced to your Google Calendar, you cannot switch it over to Outlook Calendar.